"Yes, their jokes are up there. Up there in quality, intelligence and variety. What a refreshing and engaging night of comedy this was. I was so happy to be able to bring the touring show MY JOKES ARE UP HERE to Winnipeg where the well attended Club Regent Event Centre crowd had a real blast." -Lara Rae, Artistic Director Winnipeg Comedy Festival. 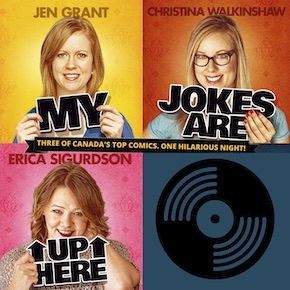 My Jokes Are Up Here with Jen Grant, Christina Walkinshaw and Erica Sigurdson. Funny women with impressive resumes and three of Canada’s top comics. They were inspired by the 2013 comedy special Women Who Kill, which features four American female comedians including Amy Schumer. Comedy is still a male-dominated field and the women thought it would be fun to showcase experienced female comedians, all of whom have 15 years or more experience in the field and headline their own shows. Jen Grant has achieved virtually everything you can achieve in the world of stand-up comedy in Canada. She has performed at every major comedy festival in the country including the Just for Laughs Festival, the Ha!ifax and the Winnipeg Comedy Festival. All of which have aired on national television. She can also be heard on CBC’s "The Debaters" and has her own TV special on The Comedy Network. She was the first Canadian to reach the finals of the prestigious Boston Comedy Competition and was recently listed as one of the top five funniest people in Toronto by Toronto Life Magazine. One of her proudest achievements was when she performed for the Troops in the Middle East. A story telling, observational style of comedian, Jen is both unique and relatable. From topics such as her cool mom to dating a younger man to her love of naps, she will have you laughing until you're crying. Funny tears. Not sad ones. Jen is a clean comic who is adaptable to any setting and is an excellent choice for any corporate function. Her ability to weave hilarious jokes with funny audience interaction is extraordinary. Christina Walkinshaw is a regular on CBCâ€™s â€œThe Debaters,â€� and she also makes (sporadic) appearances in the shower. Christina is a popular comedy writer, having been featured in The Huffington Post for her blog, â€œMy Week On Tinderâ€� which gained a large following and grabbed the attention of MTV Canada's development department. Christina recently returned from a comedy tour overseas to entertain the American Military. In 2007 Erica was awarded a Leo Award for Best Comedy Screenwriting, along with co-writer Peter Kelamis, for her writing on the 21st Annual Gemini Awards. Her comedy festival credits include Monteral Just for Laughts, The Winnipeg Comedy Festival, the Halifax Comedy Festival, the Vancouver Comedy Festival, and many others.